Never Enough Nails: A Fun Summer Mani with Lynnderella Connect The Dots! 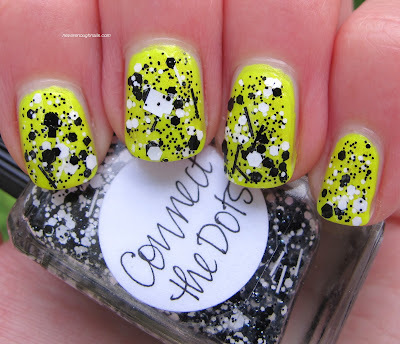 A Fun Summer Mani with Lynnderella Connect The Dots! I'm still in my mode of desperately clinging to every last bit of the fading summer season, so I'm rocking neons on both my toes and fingers! I have been wanting to try Lynnderella Connect the Dots (the new version) over a neon, and decided to wear it over China Glaze Sunkissed. This is a FANTASTIC combo!! 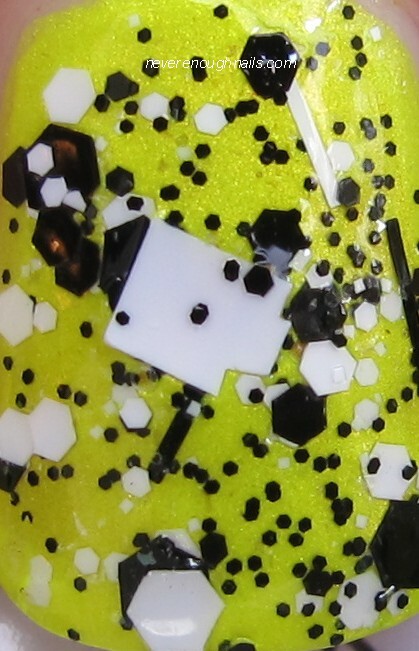 CtD looks perfect over yellow!! This is three coats of China Glaze Sunkissed with two coats of Lynnderella Connect the Dots. It was super easy to get loads of glitter on to my nails with CtD. I got a couple of huge giant white squares and on my (not pictured) right hand, I managed to get two extra large black hex glitters too! I don't own the first version of Connect the Dots, but I hear this version has more dense glitter. I'm super happy to finally own Connect the Dots and I'm loving wearing this mani right now. It's so happy and cheerful. What are you wearing on your nails at the moment? Have you embraced the impending fall season? Or are you hanging on to summer? Thanks Stef! I'm quite enjoying it myself! Yup, I got it on Lynnderella's eBay store with the rest of my Sweet Somethings for a Summer Solstice colors. The new CtD was released with that collection :). Hope you can get it again!